The only ethical and truly humane way to live is to adopt a vegan diet and lifestyle; to see all animals as having intrinsic value and to live your life in a way that reflects and supports that philosophy. Fish feel pain, demonstrate thought processes, and have a will to live; we must not dismiss their interests simply because we don’t fully understand the intricacies of their lives. Fish have the right to live free in their natural environment; they are not here for us to harm, kill, or otherwise exploit. Imagine you are having a picnic at a park with your friends and family. You see food you like and take a bite. Suddenly you feel a sharp pain in your mouth. Blood washes over your face as you struggle, unsuccessfully, to get free. You are dragged away from your family and friends, up into the sky and then outer space. You flail and struggle to breathe but you can’t get any oxygen. You feel your eyes bulge and your insides feel like they are about to explode out of your mouth due to a rapid change in pressure. Then you see large, alien creatures looking down at you. Their hands grab your body and throw you onto the floor of their ship. You gasp for air but you are not designed to breathe in this environment. You feel the cold of crushed ice packed around your body. Bleeding and in pain, you slowly suffocate to death. For more than one trillion (1,000,000,000,000) fish who are killed every year worldwide, this is very similar to what they experience in their last moments of life. While the methods in which fish are caught and killed may vary, every individual fish experiences fear and pain when dragged from their underwater homes into a world that is alien to them. Fish are not swimming vegetables; they are animals with developed nervous systems and brains capable of processing pain and fear. While this is obvious to many, some people still believe fish are incapable of feeling pain and fear, or the loss of family and friends. Several recent studies and reports prove otherwise. 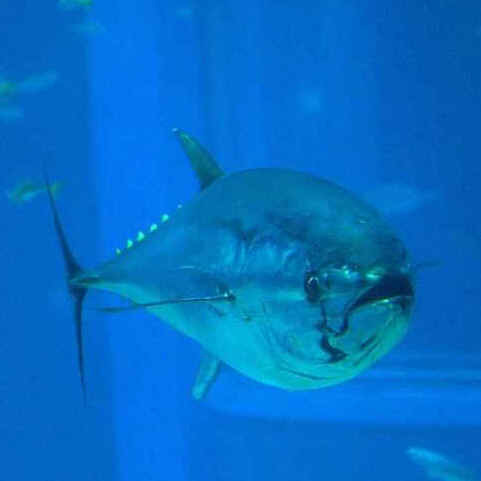 One Blue Fin Tuna...one of millions slaughtered yearly. 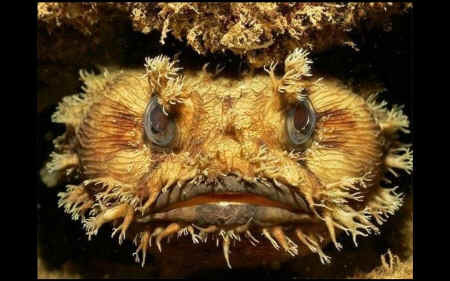 This is the face of a fish...THIS is the face of an individual living being! "There is a perception that fish have simple brains and are incapable of feelings, and this has somehow made them different from birds and mammals when it comes to our concerns for their welfare," she said. "But we now have strong evidence that suggests fish are more intelligent than previously thought and their behavior more complex." In the journal Fish and Fisheries, biologists Calum Brown, Keven Laland, and Jens Krause write, "Gone (or at least obsolete) is the image of fish as drudging and dim-witted pea-brains, driven largely by 'instinct'…Although it may seem extraordinary to those comfortably used to pre-judging animal intelligence on the basis of brain volume, in some cognitive domains, fishes can even be favorably compared to non-human primates." In a cruel experiment, Joseph Garner, an assistant professor of animal sciences at Purdue University, and Janicke Nordgreen, a doctoral student at Norwegian School of Veterinary Science, injected half of a group of fish with morphine (a pain reliever) and injected the other half with a saline solution (not a pain reliever), then subjected both groups to burning sensations. Garner describes what he observed: "The fish given the morphine acted like they always had: swimming and being fish…The fish that had gotten saline…acted with defensive behaviors, indicating wariness, or fear and anxiety." Nordgreen explains the results: "The experiment shows that fish do not only respond to painful stimuli with reflexes, but change their behavior also after the event.” That is, in addition to feeling pain, fish learn from pain. Most non-farmed fish who are killed by humans are caught in nets in the open ocean and are still alive when they are pulled from the water. These fish usually die from slow suffocation. They are often crushed to death under the weight of other fish when they are dumped onto the deck or into the hold of a ship, and many fish are packed in ice while they are still alive. Some fish also suffer from barotrauma due to the sudden change of pressure as they are pulled up from deeper water. This can cause their eyes to pop out of their heads and their swim bladders to burst or be pushed out through their mouths. Some fish caught in gill or drift nets, large curtain nets that hang in the water, may suffocate underwater. The fish swim into the net which entangles them by their gills. This constricts their gills, making it impossible for them to breathe. Gill nets, like other types of nets, catch indiscriminately. Bean and Demersal otter trawling is used to catch bottom fish and involves dragging nets across the ocean floor. This disturbs the natural environment and can destroy sensitive marine ecosystems. It also causes the fish to be dragged and bumped along the bottom before being pulled in. Pelagic trawling involves setting nets on schools of fish, usually in shoals. Animals feeding on the fish are often caught and drown in the nets. Nets catch indiscriminately; anything in the ocean that is entangled in a net will get caught and usually perish. This “by-catch” is usually thrown overboard and not counted in a ship’s quota. In addition to non-target species of fish, by-catch can include dolphins, turtles, birds, rays, and sharks. Shrimp nets are notorious for catching endangered sea turtles. Another common way of catching wild fish is called long-lining. It involves setting out a length of line, often 50 miles or longer, to which short lengths of line, or snoods, carrying baited hooks are attached at intervals. Each of these hooks is baited by impaling a smaller fish or squid. This method is used for catching larger fish, such as tuna and swordfish. Fish caught by long-lining or other hook and line methods often spend hours hooked through the face, head, or with a hook in their stomach, before being pulled from the water. Some fish are eaten alive by predators, some die from exhaustion or trauma, and others die from suffocation. When they are finally pulled in they are impaled by a large pole hook called a “gaff” and pulled aboard the boat, resulting in potentially deadly wounds and trauma to their heads or bodies. Long-lining also poses a great threat to seabirds. Species such as albatross, petrels, shearwaters, and fulmars scavenge on baited hooks, get hooked, are dragged underwater and drowned. Fish who are not suffocated or beaten to death, or fish caught by ships that also process them on board, will die from beheading or evisceration - often being skinned and gutted while they are still alive and conscious. If any of the things people do to fish were done to a dog or a cat it would constitute felony animal cruelty, yet over a trillion fish suffer and die every year in such cruel ways. In the US, fish (like birds and rabbits) are not covered under the Humane Slaughter Act. Even if they were, any “humane” slaughter laws would be nearly impossible to follow given the vast numbers of animals killed, their small size, and the fact they are not slaughtered in their natural underwater environment. Enforcement would also be difficult given the above factors, and because many fish are not caught in US waters. Of course, discussion of humane slaughter [of any animal] is merely academic, as taking a sentient life for pleasure or profit is never humane. Over 40 percent of fish now consumed are raised in either land-based tanks or enclosed pens in the ocean. With fewer wild fish in the oceans more and more fish will be raised this way. The United Nations' Food and Agriculture Organization reports that fish farming is growing three times faster than land-based animal agriculture. Farmed fish are forced to spend their entire lives in cramped, filthy enclosures where many suffer from parasitic infections, diseases, and debilitating injuries. In the severely crowded pens and tanks small fish are bullied and killed by larger fish, so fish are continually sorted and grouped by size, a practice called “grading.” Fish are sorted through a large strainer; small fish fall through while larger fish do not. Repeated sorting stresses and injures fish, leaving the animals vulnerable to disease. Because they are designed to navigate vast oceans, many fish go insane from the cramped conditions and lack of space on fish farms. The tight enclosures inhibit their ability to navigate properly, causing them to run into each other and the sides of the enclosures, resulting in sores and damage to their fins. To increase profits fish on farms are severely crowded. Salmon farms are so crowded—with as many as 50,000 individuals in each enclosure—that a 2.5-foot fish spends his or her entire life in a space the size of a bathtub. Trout farms are even more crowded, with as many as 27 full-grown fish in a bathtub-sized space. High concentrations of fish lead to disease, so fish farms lace feed with antibiotics and chemicals. As many as 40 percent of farmed fish die from disease, stress, or cannibalism. Fish who survive are starved before they are sent to slaughter in order to reduce waste contamination of the water during transport. Salmon, for example, are starved for 10 days. Many farmed fish are beheaded or disemboweled while fully conscious. Others are pulled from the water and left to die from suffocation, or are packed in ice while still alive, prolonging their suffering. Some larger fish are beaten to death with a wooden bat called a "priest." On top of the cruelty and obvious health and environmental risks of fish farming, many farmed fish are fed pellets made from wild caught fish. It can take up to five pounds of wild-caught fish to produce just one pound of farmed fish. Even naturally vegetarian fish are being fed fish oil and fish meal on fish farms. It's likely that these fish pellets are the cause of the higher PCB and dioxin contamination levels found in farmed fish, which are seven times higher than the already-dangerous levels found in their wild counterparts. Fish farms take another toll on wild fish in the form of pollution. Excrement, uneaten chemical-laden food, and parasites from ocean-based farms spread to the surrounding ocean, and the rampant disease inside the cages is passed on to ocean fish in the area, in some cases increasing the incidence of sea lice a thousand fold. These parasites eat at the fish, causing their scales to fall off and creating large sores. In severely crowded conditions, lice often eat down to the bone on fish's faces. This is so common that fish farmers named it the "death crown." The only ethical and truly humane way to live is to adopt a vegan diet and lifestyle; to see all animals as having intrinsic value and to live your life in a way that reflects and supports that philosophy. Fish feel pain, demonstrate thought processes, and have a will to live; we must not dismiss their interests simply because we don’t fully understand the intricacies of their lives. Fish have the right to live free in their natural environment; they are not here for us to harm, kill, or otherwise exploit.